The Indianapolis Colts came from behind to defeat the New York Giants 28-27 at Lucas Oil Stadium in Indianapolis, Indiana on Sunday. With the loss, the Giants fell to 5-10 on the season. Indianapolis received the football to start the game but their first three drives ended with two three-and-outs and an interception by free safety Curtis Riley. Meanwhile, the Giants jumped on top quickly with their first two drives ending in touchdowns. First, New York went 75 yards in 11 plays, the possession culminating with a 1-yard touchdown run by running back Saquon Barkley. 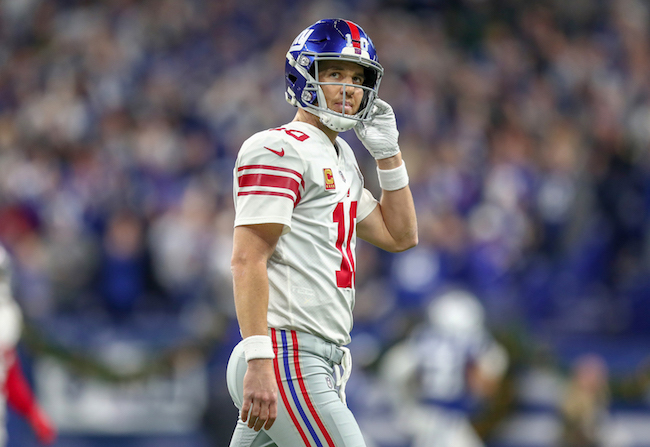 Then the Giants drove 87 yards in nine plays, the big play being a 55-yard strike from quarterback Eli Manning to wide receiver Sterling Shepard. Manning finished this possession with a 3-yard touchdown throw to tight end Scott Simonson. After New York went three-and-out on their third drive, the Colts responded with a 12-play, 78-yard possession that ended with a 1-yard touchdown run by running back Nyheim Hines with just over four minutes before halftime. The Giants then extended their lead by moving the ball 53 yards in nine plays, setting up a 40-yard field goal by place kicker Aldrick Rosas. The Colts could not get into scoring position on their last possession of the first half. At the half, the Giants led 17-7. After picking up one first down on their initial possession of the 3rd quarter, the Giants punted the ball away. The Colts proceeded to cut the score to 17-14 with a 7-play, 85-yard possession that ended with a 2-yard touchdown pass from quarterback Andrew Luck to wide receiver Dontrelle Inman. Luck also completed a 55-yard pass to wide receiver T.Y. Hilton on this drive. The Giants impressively responded with their own touchdown, moving the ball 85 yards in eight plays, including a 32-yard pass to tight end Evan Engram. Manning finished the drive with a 1-yard touchdown run and the Giants led 24-14. However, the Giants defense could not hold and the Colts scored their second touchdown on their second possession of the half after a 7-play, 74-yard affair that ended with a 3-yard touchdown run by running back Marlon Mack. At the end of the 3rd quarter, the Giants led 24-21. The Giants reached the red zone on their ensuing possession but were forced to settle for a 27-yard field goal by Rosas. Both teams then exchanged punts, the Giants being forced to punt out of their own end zone. Trailing by six points, the Colts’ subsequent possession began at their own 47-yard line with 3:43 left in the game. A 2-yard pass interference penalty on 3rd-and-3 by linebacker Tae Davis gave the Colts their first first down. Luck then scrambled for 14 yards and threw four consecutive passes for a total of 22 yards down to the Giants’ 8-yard line. Cornerback B.W. Webb was then flagged with a 7-yard pass interference penalty. With 59 seconds left in the game, Luck found wide receiver Chester Rogers for the 1-yard, game-winning score. The Giants began their final desperate drive at their own 25-yard line with 55 seconds left and just one timeout. After completing two short passes for 11 yards, Manning’s deep throw to wide receiver Bennie Fowler was intercepted at the Colts’ 35-yard line with less than 30 seconds to play. Offensively, Manning finished 25-of-33 for 309 yards, one touchdown, and one interception for a QB rating of 101.7. His leading receivers were Sterling Shepard (6 catches for 113 yards), Engram (6 catches for 87 yards), and Barkley (5 catches for 34 yards). However, Barkley was held to 43 yards rushing and one touchdown on 21 carries. Defensively, the Giants allowed just 49 yards rushing, but 353 net passing yards. And after holding the Colts to just one score in the first half, the defense allowed three touchdowns in four drives in the second half. Indianapolis was 4-for-4 in red zone opportunities. The Giants forced only one turnover (interception by Riley) and only picked up one sack (by linebacker Tae Davis). Inactive for the New York Giants were wide receiver Odell Beckham, Jr. (quad), wide receiver Russell Shepard (ankle), center Spencer Pulley (calf), defensive end Kerry Wynn (finger), linebacker Alec Ogletree (concussion), quarterback Kyle Lauletta, and safety Kamrin Moore. Tight end Rhett Ellison (concussion) and defensive end Mario Edwards (calf) left the game with injuries and did not return.